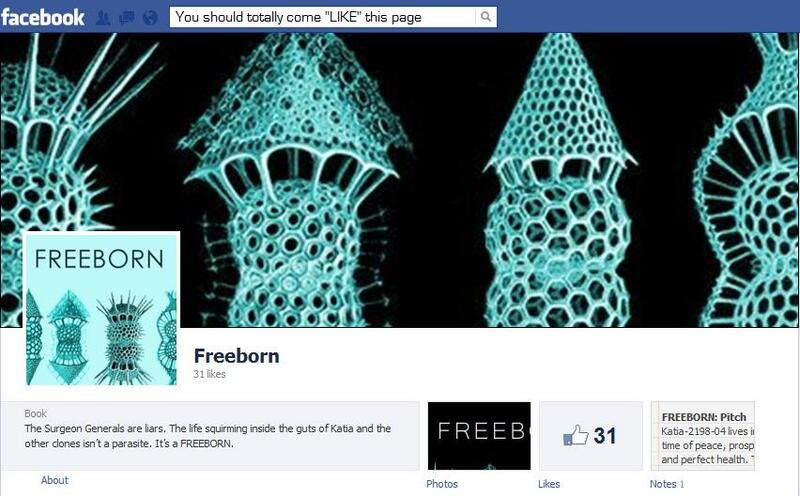 Just like his older brother before him, FREEBORN now has his own Facebook Page. Stop by and give it a “Like”. It costs absolutely nothing, and you can watch the little tyke as he grows up and makes his way to market. In the novel, the Infection is viral. It’s hard to imagine that a Facebook Page for an [as-of-yet] unpublished book could be as well—but hey—an author’s gotta have dreams ya know. This entry was posted in Freeborn, Novel, Pitches, Publishing, Writing and tagged Facebook, Like, Page, Tell Your Friends. Bookmark the permalink. Thx, Linds. Gonna try my hardest to keep the excerpts fresh.